ALIQUID: New ALIQUID Lacquer collection! 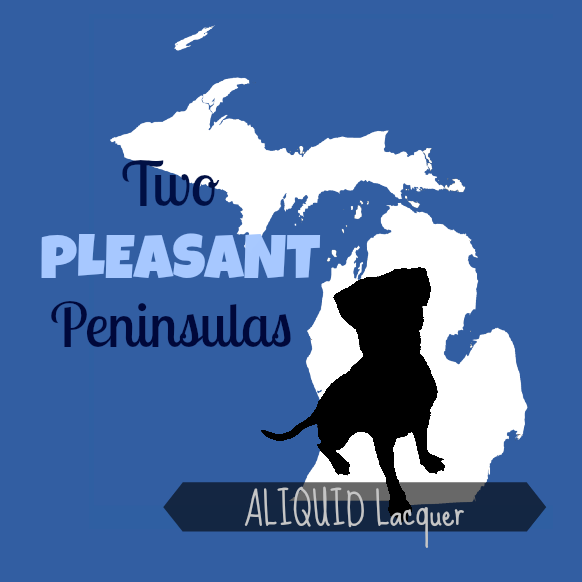 Two Pleasant Peninsulas plus GIVEAWAY! This collection is pretty personal to me because a lot of the polishes are inspired by places and things I grew up with. Michigan has a lot of natural beauty, and I think the polishes I made reflect this. I hope you like them! 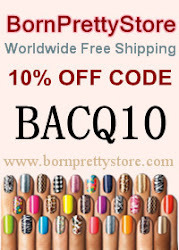 Before I show you the polishes, I want to tell you about some special offers going on at my shop right now! Through July 14, if you spend at least $15 on an order, you can get 15% off with the coupon code MITTEN and you get a free lip balm of your choice (just leave me a note at checkout with your preferred scent)! 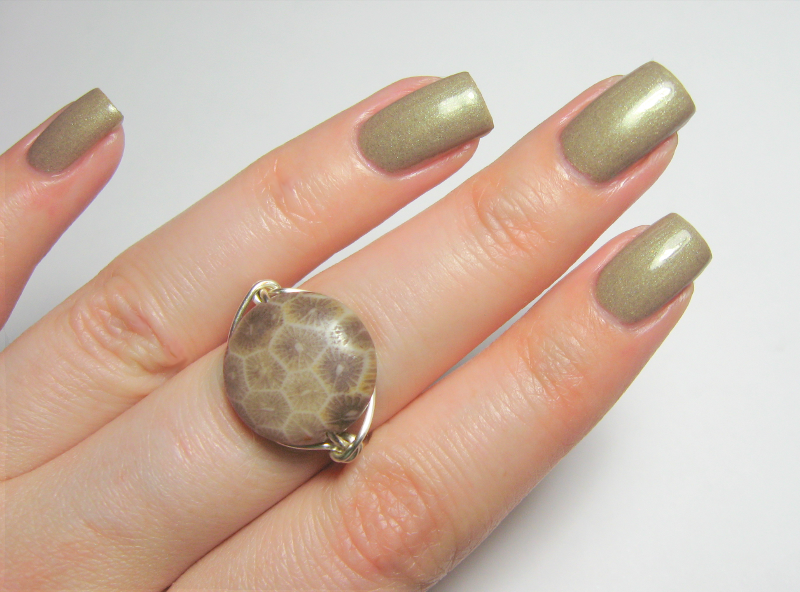 Let's start with this shimmery polish that's inspired by Michigan's state stone. The Petoskey stone is actually a 400-million-year-old fossil of a coral called Hexagonaria percarinata. 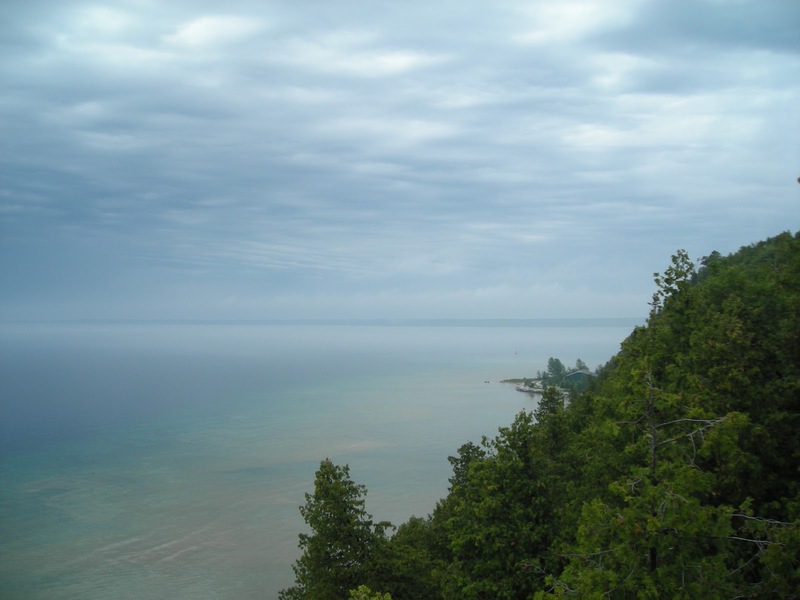 The fossils were deposited on the northeastern shores of Lake Michigan by the movement of glaciers. My sister and I found a few Petoskey stones on vacation when we were kids. 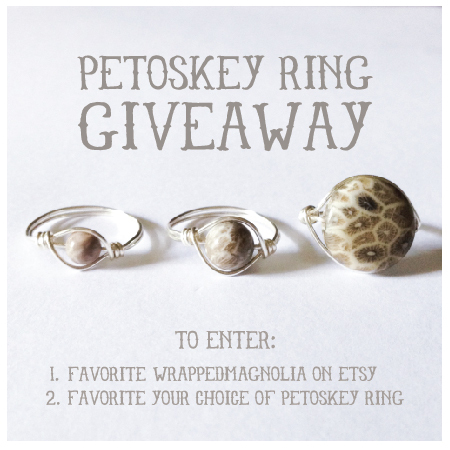 Read to the bottom of this post for a Petoskey-related giveaway! Detroit is perhaps most famous for being the city where I was born...well, OK, I guess not JUST that. It's also the home of the automobile and the assembly line. I thought a jelly full of metallic circles and squares would represent it perfectly! 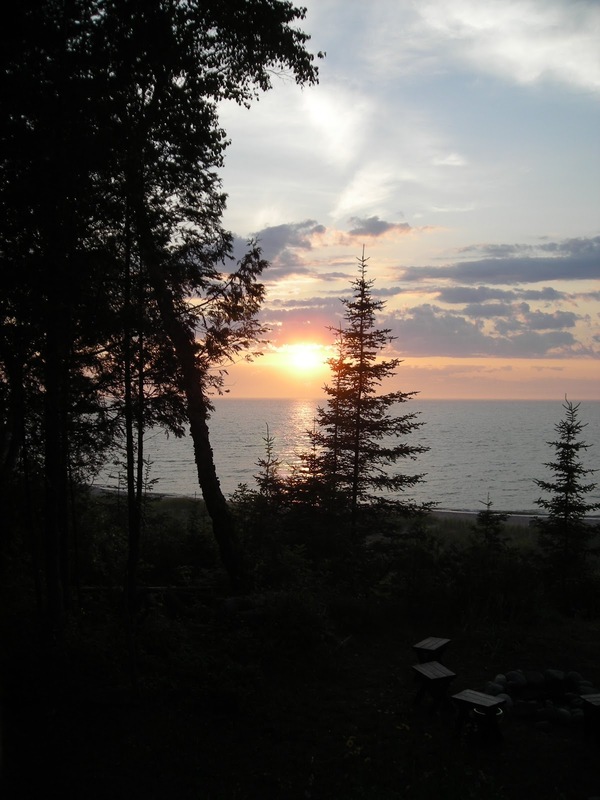 "Yooper" is an affectionate term for residents of the Upper Peninsula (the "U.P."). The Upper Peninsula is much less developed than the Lower Peninsula, with only 3% of the state's total population. It has a lot of forests, lakes, and even some small mountains. This polish is named for the alliance of three closely related Algonquian tribes native to Michigan and neighboring areas: the Ojibwe, Ottawa and Potawatomi. (I definitely remember learning how to pronounce "Potawatomi" in elementary school!) These peoples developed a pictographic writing system to record their history, myths, and medicinal recipes, which continue to be passed on to the next generation. Sorry for the bad pun! The two peninsulas of Michigan are separated by the narrow Straits of Mackinac, where Lakes Michigan and Huron meet. 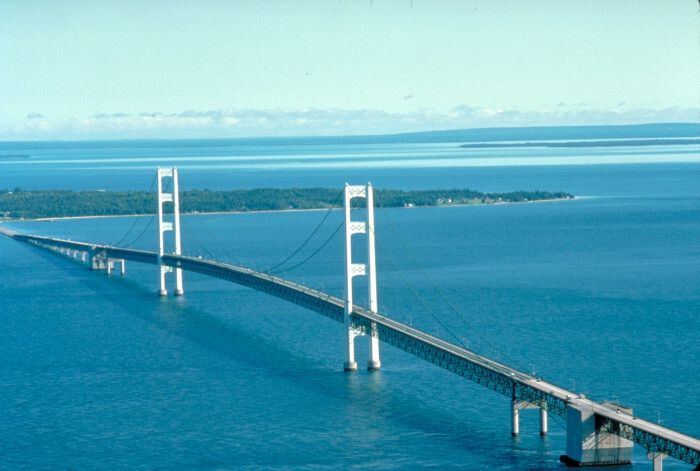 The Mackinac Bridge, one of the longest suspension bridges in the world, connects the two halves of the state. My family has taken a lot of trips to Mackinac Island, which is just a few miles from the bridge. On Mackinac you can get some amazing handmade fudge! In addition to these eight polishes, I've also made two Michigan-themed lip balm scents: chocolate cherry fudge (which contains cocoa butter for extra chocolateyness) and maple! 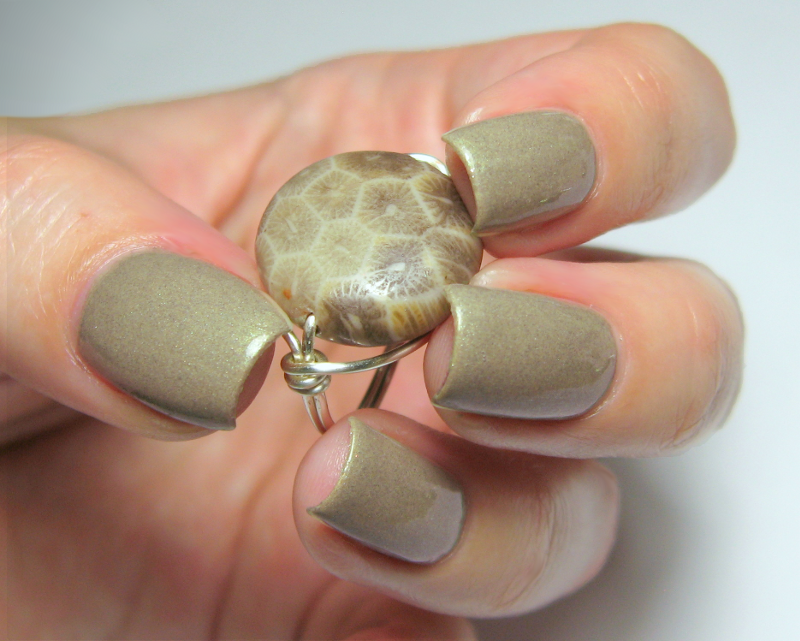 This ring is so simple and rustic--just a gorgeous Petoskey stone wrapped in silver-plated wire. The stone really speaks for itself, don't you think? And every one is unique! Luckily for you, Aimee from Wrapped Magnolia has agreed to team up with me to give away one of her beautiful rings! The stones come in three sizes, and you can choose between silver and gold wire! 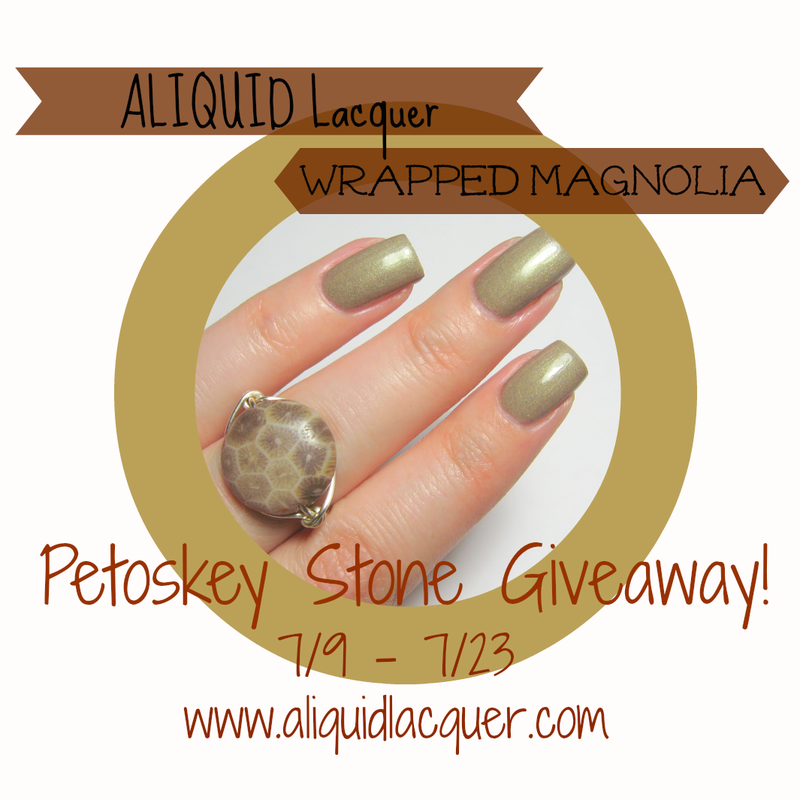 In addition, I'll be giving away one bottle of ALIQUID Lacquer Petoskey Stone plus any other polish of the winner's choice! Here are the giveaway rules! Please read them carefully! Giveaway is open to U.S. residents only. Winner must be able to provide a U.S. mailing address! Giveaway runs from now until 11:59 PM EST on July 23. Winning entries will be verified, so no cheating! There are four mandatory entries, which are displayed first in the Rafflecopter widget. You must complete ALL these entries! The winner must reply to my email within 48 hours, or a new winner will be chosen. 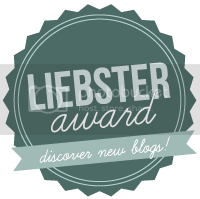 You can enter using the Rafflecopter widget below. Good luck!! What exciting colors in your new collection! I love Two Pleasant Peninsulas! Kudos, Aliquid Lacquer! Love the cherry Festival and the Pearl Ring ! Da Yoop also has lots of waterfalls! My dad had this thing about visiting waterfalls every time we went on our annual trip up north, and I'm not talking about just Tahquamenon. This collection is so cool! We just visited Traverse City in April and so many memories! Thanks for this wonderful giveaway!